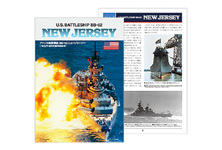 【 The Big J Circa 1982 】　The 45,000-ton Iowa-class was the the largest and last battleships built by the U.S. Navy. The USS New Jersey, affectionately known as the "Big J," was the second ship of this class and saw service in WWII from early-1944. However, the advent of carrier airpower changed the nature of naval warfare and New Jersey was withdrawn from frontline duty after WWII in 1948. She was reactivated to participate in the Korean War and Vietnam War, but was again placed in reserve in 1969. However, thanks to President Reagan's policy of strengthening the navy, the modernization of the Iowa-class was proposed in 1981 and New Jersey was chosen as the first ship to undergo this program. She was equipped with new weaponry including Tomahawk cruise missiles, Harpoon anti-ship missiles, and Phalanx CIWS as well as new radars, ECM, and other electronic systems. She served as a missile-carrying battleship until her final decommissioning in 1991 and was eventually stricken from the U.S. Navy register in 1995. USS New Jersey was then restored to become a floating museum in Philadelphia. 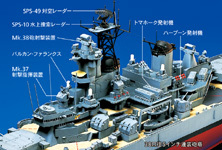 【 About the Model 】　★1/350 scale plastic assembly kit depicts the USS New Jersey as she appeared in 1982. ★Length: 774mm, Beam: 94.5mm, Height: 182mm ★The superstructure and slender hull with clipper bow are accurately reproduced. Screw shafts are made from stainless steel. ★The modern equipment including Tomahawk and Harpoon missile launchers as well as Phalanx CIWS are highly detailed. ★Comes with parts to depict two SH-60B Seahawk helicopters. ★Other accessories include two 1/350 scale 16-inch shells and two Tomahawk missiles. 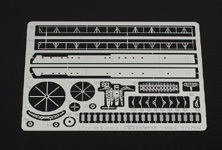 ★Decals are included to depict the helicopter pad. ★Full hull model display stand is included. 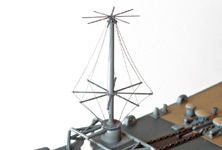 ■Both injection-molded and photo-etched parts are included to depict the discone-cage antenna at the bow. 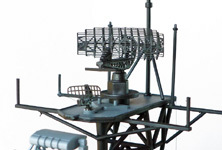 ■Photo-etched parts precisely recreate the mast radar antennas. ■Precision-made photo-etched parts enhance detail throughout the model. 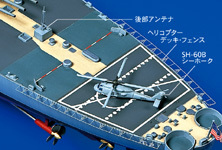 ■Helicopter deck fencing may be assembled in up or down position. ■New parts such as 12.7cm gun turrets, Mk.38 fire control systems, and Mk.13 fire control radars have been included. ■Comes with a B5-size, 14-page reference booklet.